Often confused by the difference between slow cooker vs. crock pots? In this post, I will discuss the similarity and differences between this two kitchen equipment. ​With people’s lifestyles rapidly evolving, modern technology indeed does a good job at enabling all of us to cope with society’s changing demands. ​Traditional ways of cooking are no exception to this change as products such as the slow cooker and the crock pot gain popularity as a consequence of busy modern living. ​I personally consider these pieces of equipment as machines, more like robots even, that cook meals by themselves with very little human intervention needed. ​Having the luxury of this cooking convenience indeed allows us a more productive use of valuable time that could easily be consumed by tediously attending to chores in the kitchen. Holding on to this promise of cooking convenience, I personally acquired one recently and had not for once regret that purchase decision. ​Much like most of you, I honestly thought that crock pot and slow cooker were interchangeable terms for the same thing. Only when I did some research on which brand or specific model was worth the investment did I come to find out that there are some differences between a crockpot and slow cooker. ​For those who have landed on this reading looking for the answer to the question of “which is better slow cooker or crock pot,” then I assure you that reading on will certainly suggest a clear decision. 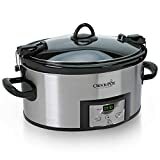 ​But before we move on, below are images of a slow cooker and a crock pot respectively. These are mere examples and not product endorsements in any way. While both of this cooking appliances look like they serve the same purpose but some points do set them apart differently. Whether choosing a slow cooker or a crock pot is pretty much determine by your household cooking needs. Let’s look into the points that make these two kitchen appliances similar to each other. Let’s start with this similarity that is visually perceptible to us. Both come with three major parts – a heating element, a cooking vessel, and a lid. ​Seems enough to prompt us of believing that they’re identical right? That the sizes of crock pots, or slow cooker prices are the only things to consider? ​The slow cooker and crock pot heating element and the cooking vessel may look similar but the materials used to make them are different. Hence they serve a different cooking purpose. ​Practically, the only part that these two pieces of equipment could interchangeably share would be their lids, given that they’ll line-up, which are both engineered with a very precise fit to keep a maintained internal cooking temperature during operation. ​Both are made of clear glass allowing us to monitor the contents of the pot without having to open it, a practice which would lead to a significant amount of heat escaping. Here’s where the slow cooker vs. crock pot battle nearly evens up. Both are plug-and-play, throw-all-ingredients-in-the-pot wonders of the modern kitchen. ​With their tight-fitting lids, the temperature inside the cooking pot is pretty much kept constant from start to finish, resulting in very predictable cooking times for specific ingredients. ​Also, this seal eradicates the tedious task of having to monitor the cooking liquid inside the pot for possibly drying up. ​If going to work in the morning knowing you’ll be coming home to a hearty stew for dinner doesn’t speak ease of use, then I don’t think anything else will. The differences between these two pieces of kitchen equipment in this regard may well be enough to sway you into buying one over the other. For this reason, I’ll keep this concern for a more detailed discussion later in this article. ​So, what is a slow cooker and crock pot usage? ​There are many food preparations that these two cookers are capable of producing. Recipes made specifically for the long cooking hours these things are designed for, can easily found from various food websites at present. ​But for now, let me tell you that the dishes that can be suitably prepared with each corresponding equipment do differ much larger than most of us know or think. I will be discussing the differences between the slow cooker and the crockpot in the very same outline I used to present the similarities, above. ​I will also be pointing out corresponding strengths and weaknesses of each based on these facts as I go along. I think doing so will better guide for you if you're considering the purchase of either a slow cooker or crock pot. Most slow cookers come with a cooking vessel made of metal. While needing a shorter time to pre-heat, metal vessels prove to be less efficient at maintaining a certain cooking temperature compared to its ceramic counterpart that comes with all crock pots. ​This perceived shortcoming though is made up for by its versatility in the kitchen. Its metal construction allows for it to be set on the stovetop or even inside the oven much like any other metal stockpots that you already have. ​This eliminates the need for additional pans for certain recipes that require searing or sauteing in the beginning. ​Some preparations may even call for finishing off the dish in the broiler oven which is totally impossible to do with a ceramic vessel without having the need for additional oven-safe dinnerware. Crock pots come with a heating element that surrounds its ceramic cooking vessel from the bottom to its walls. This translates to a more uniform distribution of heat throughout the pot enabling even large cuts of meat to cook evenly. ​Slow cookers, on the other hand, come with heating platforms which are placed exclusively at the bottom. This placement causes food surfaces in contact with the bottom of the pot to cook too fast to the point of scorching even before its core comes to an ideal internal temperature. ​Because of this, food has to be monitored periodically for burning, which totally defeats the purpose of carefree cooking that made us consider buying into this equipment in the first place. ​Furthermore, the need to stir your ingredients around once in a while forces you to open the lid, causing heat to escape. This temperature drop in effect extends cooking time significantly. ​Also, the placement of heating elements along the bottom and walls of a crockpot ensures that big cuts of food, especially with meat, reach a safe internal cooking temperature faster, which is not the case with a slow cooker. ​Due to this, food to be cooked in the slow cooker is advised to be chopped into relatively small pieces to eliminate any risk of bacterial activity. As I’ve stated in the discussion of their similarities, the award for ease of use in the slow cooker vs. crock pot battle again comes into close contention with the latter having a slight advantage. ​Some slow cookers such as the one shown at the beginning of this article come with multiple settings compared to the high, low, and keep warm options standard to most crockpots. ​However, also consider the possibilities that open up from the ability to cook for long hours without any supervision if using a crockpot. Something impossible to do in a slow cooker with its bottom-heating mechanism. ​In favor of the slow cooker, you may, however, see the need for cooking with additional pots and pans much of a hassle when working with a crockpot. The ability of the slow cooker's vessel to be used on top of the stove or inside the oven, thanks to its metal construction, may make you think that it has the clear advantage for flexibility over a crockpot. ​Going back to issues bacterial contamination as a result of uneven heating, however, prove otherwise. As mentioned earlier, ingredients intended to be cooked from start to finish in the slow cooker must be cut into smaller portions. ​This precautionary practice limits the slow cooker’s repertoire of dishes to soups, stews, or a menu of light poaching. ​It really depends on what your personal definition of flexibility is, but the ability to pull off roasts, whole braised meats, casseroles, and the like certainly make the crock pot a winner for me in this regard. 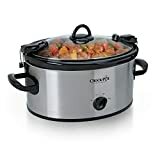 To find the best slow cooker and crock pots, we went through hundred of product listing at sites like Amazon, here are the top 3 slow cooker and crock pots that received the highest praise for its quality as well as ratings that we found. Which of these two cooking appliances win in this slow cooker vs. crock pot battle ultimately comes down to your personal definitions of flexibility and ease of use. ​If having to deal with much more separate cooking equipment to clean-up poses as a heavy chore for you, then the metal vessel of the slow cooker would save you from all this hassle. ​However, I personally would not give up the possibility of cooking my roasts, braised meats, or pasta in a shove-it-all-in-and-walk-away fashion that’s why going for the crock pot was really a no-brainer. ​Though there are differences between slow cooker and crock pot, if your kitchen is large enough to place this two kitchen helpers, I do not see why you should only pick one. Since both do serve different purposes when coming to cooking, it can be handy when you have a slow cooker and a crock pot side by side ready for your disposal at any time.